I know these are on Whitney's blog, so they might be a repeat for some of you. But...I thought they were pretty important. 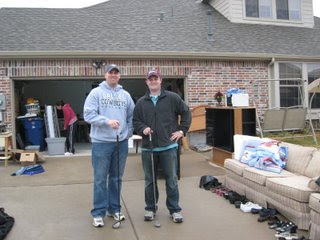 This was the first time that Tab & I had actually been selling things in a yard sale. 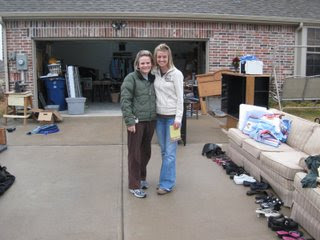 All of that furniture was our stuff. None of the furniture even sold! We had to pay the dump to take our couches because they got turned down by Goodwill!! We worked really hard on Friday night pricing everything and getting it all organized. On Saturday morning, I was persuading Tab to get out of bed bright & early so I leaned over & said, "Maybe after today you won't have to work...we'll make SO much money". It got him out of bed, but it was SO far from the truth! I think after paying the dump, Tab & I made a total of $70!! That's it!! We all thought we deserved a nice big lunch afterwards...so we went to Hutchin's BBQ in McKinney. It was delicious...you should definitely try it out!